There are tons of great satay places out there, but I think any satay-lover worth his or her stick would naturally gravitate toward the great vendors of Chinatown, where cooks manage that delicate balancing act between art and commerce, churning out thousands of bamboo skewers of grilled pork (it’s almost always pork, although apparently the skewer started out as a vehicle for beef or mutton) a night. Jay Eng, on the corner of Plang Nam next to the Canton Shrine, is a favorite of my parents’ and I understand why — it’s grilled porky perfection with a spicier version of the peanut dipping sauce and quick, efficient service. But such dinky little pieces of pork! You know that’s not enough for Glutton queens like moi. Which is why I prefer Chongki (84-88 Soi Suthorn, 081-615-8733), on the border between Chinatown and Hua Lumphong, and purveyor of the meatiest pork skewers around. Each order comes with a plate of peanut sauce and a bowl of ajad (cucumber-shallot relish with peppers), and slices of freshly grilled bread for just a little extra. Satay fusion food…Arabic slicing and cooking technique…Muslim traders in Thai-Malay Peninsula e.g. 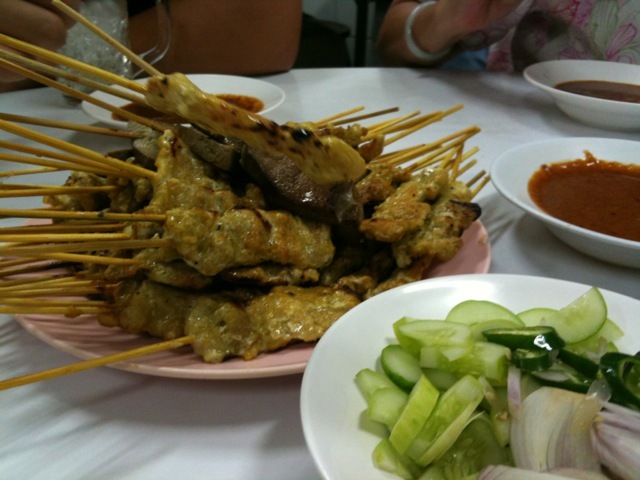 Melaka port…Baba-Nonya modification with pork meat…’other meat’ satays in Malaysia and Indonesia…To trace its origin, you need to trace A-jad and Satay’s arrival in Penang!